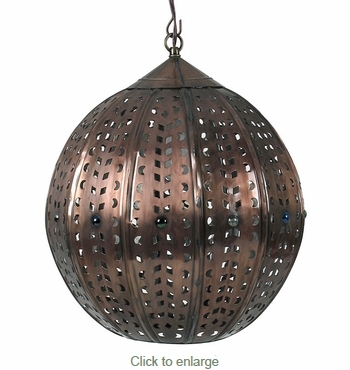 This punched aged tin sphere hanging light is accented with colored glass marbles around the center and makes a dazzling addition to your Spanish colonial or Tuscan decor. All of our Mexican tin light fixtures are handmade by artisans in Mexico. Since each rustic fixture is individually hand crafted, color and finish may vary slightly from what's pictured here. Chain and ceiling plates are sold separately.